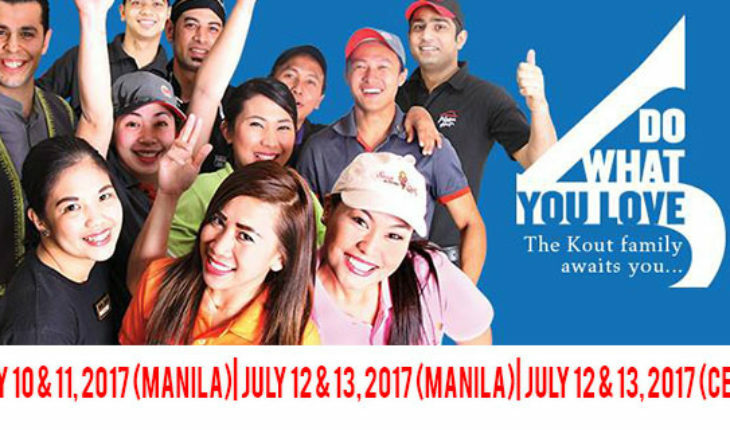 Are any of your family and friends interested in working for Kout Food Group? 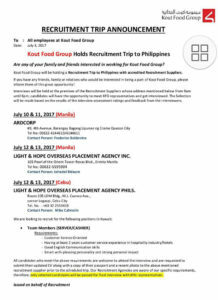 Kout Food Group will be holding a Recruitment Trip to Philippines with accredited Recruitment Suppliers. If you have any friends, family or relatives who would be interested in being a part of Kout Food Group, please inform them of this great opportunity! Interviews will be held at the premises of the Recruitment Suppliers whose address mentioned below from 9am until 6pm, candidates will have the opportunity to meet KFG representatives and get interviewed. The Selection will be made based on the results of the interview assessment ratings and feedback from the interviewers. All candidates who meet the above requirements are welcome to attend the interview and are requested to submit their updated CV along with a copy of their passport and a recent photo to the above mentioned recruitment supplier prior to the scheduled trip. Our Recruitment Agencies are aware of our specific requirements, therefore; only selected candidates will be passed for final interview with KFG representatives.